Effective onboarding provides an organization with a reliable foundation of talent well into the future. It can become a cornerstone to everything from improved productivity and brand perception to a healthy workplace and culture. However, although the best onboarding processes streamline their various components for efficiency and enduring impact, there are still enough moving parts involved to require a highly organized, meticulous approach to all facets of onboarding. For that reason, Hyphen is lending you our unique insights into onboarding, providing a few simple best practices that won’t require much time and effort but can pay substantial dividends down the road. We’ve also created a concise list to keep handy before, during, and after the onboarding of each new employee to keep track of what has been completed, has yet to be accomplished, and how it all fits into the bigger picture. Download the only onboarding guide you'll ever need. Remember, innovation can spring from any team member at any time, so it’s in every organization’s best interest to maximize the impact every new employee has on the enterprise. As always, we’re here to provide you the feedback-driven people data necessary to make a fulfilling employee experience that begins with onboarding – and the satisfying, productive workplace that results – a reality. Being the newcomer to a workplace can already be an intimidating experience, surrounded by a seemingly endless stream of new faces, tasks, and procedures. An ill-prepared workstation or, even worse, a cluttered or messy one definitely won’t make a new employee’s first day memorable for the right reasons. Therefore, treat your new hire's first day like they’re an old friend rather than a stranger. Have their workstation stocked with anything and everything needed for them to be successful in their new position, including supplies, their computer and monitor, technology subscriptions they'll need, and anything else that will help them hit the ground running. A handwritten note from an executive welcoming them to the family can also be a much appreciated personal touch that can immediately make your new team employee feel important and valued. A small, company branded gift – even something incidental like a smartphone cover or shirt – will further extend a welcomed feeling. Whatever approach you take and traditions you embrace, just make sure it's part of an overall effort extended throughout the first few weeks of employment, paying particular attention to that all-important first day. In fact, with nearly 4% of new hires leaving their new job after a horrendous first day, it simply makes sense for everyone involved to do everything you can to make it an educational and enjoyable experience. As the old saying goes, there's no “I” in team. The onboarding process involves many people from different departments, all needing to work in a cohesive, collective fashion to establish a positive onboarding experience for a new employee. Create a detailed schedule ahead of time that clearly spells out who is responsible for which particular onboarding tasks, when they will be accomplished, and group them with similar activities to maximize efficiency. 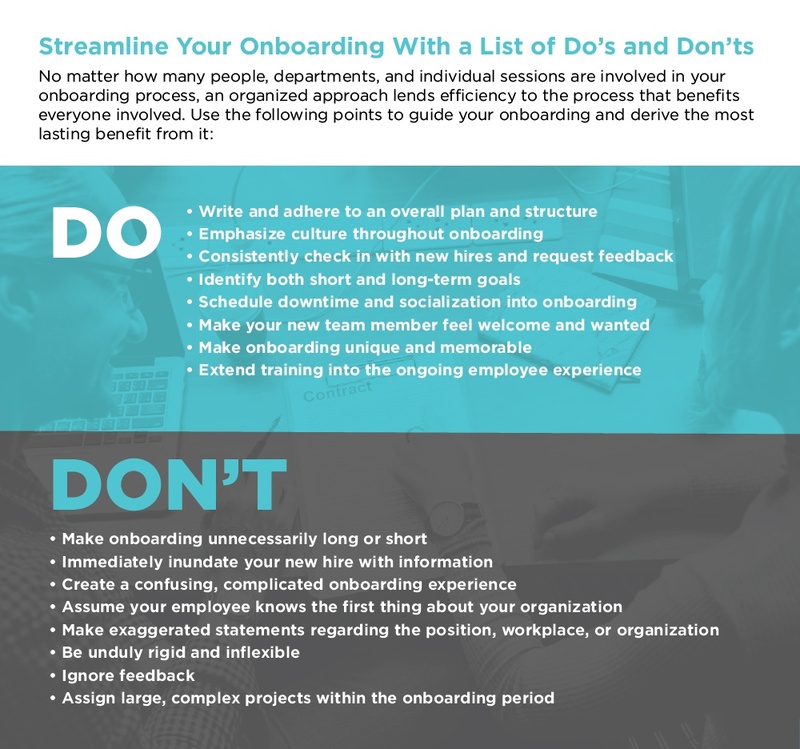 Otherwise, onboarding can quickly become a tangled, confusing series of disconnected moments that achieve nothing more than giving the new hire second thoughts on accepting the position in the first place. Speaking of the new hire, provide them with their own list of goals and tasks they need to accomplish throughout the onboarding process, including a detailed schedule as well as the supervisors or coworkers that might be assisting them. Introducing them into some semblance of a regular, daily routine will ramp them up faster and allow them to become more self-sufficient and productive. Even the most talented of new employees will ultimately become a detriment to the overall organization if they don't adhere to your policies and embrace your culture. Throughout onboarding, continue to revisit different facets of your organization's mission and culture to make certain it's fully absorbed, understood, and accepted. On a smaller scale, this component of onboarding should cover their daily routine, including when to arrive and leave the office, protocol for answering calls – particularly when dealing with the customer base – working from home after office hours, communicating with management, and the social aspects to the workplace. Depending on their position, and emphasis should be placed on service-oriented topics if a new hire has any communication with customers. Such topics should naturally include a thorough understanding of the products and services your organization offers – information that is helpful even to those employees that don't directly deal with your consumer segments. Be sure to provide written documentation to accompany the verbal instruction received during onboarding so a new hire can reference those materials whenever needed. While HR and management undoubtedly play a pivotal role in the onboarding process, there is something to be said for letting someone from the proverbial frontlines show a new hire the lay of the land. It provides the new team member and impactful perspective that is more representative of what they'll experience on a daily basis going forward. As instrumental as classroom instruction can be to onboarding for the simple purpose of conveying and absorbing important information, there will always be questions regarding the minutia of the workplace and job itself that are best answered by a knowledgeable coworker serving as a guide. To make the most of such a mentorship, however, make every attempt to request volunteers for the role rather than randomly assigning them. A new hire will gain a lot more from the experience if the mentor is excited to be in the position and doesn't view it as a hindrance to their other responsibilities or waste of their time. Likewise, make sure the coworker and new employee are a good personality match as they will be spending a significant amount of time with one another, including lunch breaks or even office social events. This is especially important for millennials and Gen Z employees, where 74% of them rank effective workplace collaboration as an essential component of a satisfying employee experience. If a long journey begins with a single step, assume that perspective throughout your onboarding process to help temper an organization’s initial expectations and maintain focus on what lies ahead. Don't deluge your newest team member with an avalanche of information that can be, at best, a bit disorienting and, at worst, downright frustrating and intimidating. Most importantly, structure your onboarding approach so that information builds on itself, using yesterday's sessions as the foundation for today's talking points. This will ensure an effective, gradual immersion into your organization, job expectations, important procedures, and simply becoming a productive member of the team. Throughout the onboarding process, don't be shy to ask your new employee for their opinion on the process and anything that leaves room for improvement. Of course, given a new hire’s position within the organization, they might feel uncomfortable providing anything resembling criticism of their new employer and your onboarding procedures. Therefore, keep such requests informal and within a relaxed environment, perhaps even using anonymous surveys to eliminate any undue pressure a new hire might feel while providing authentic, unbiased feedback. Also, feedback should not be a one-time event but a continuing process, used consistently throughout every stage of onboarding to better inform each component of the process. Of course, Hyphen's own dynamic feedback system provides an extremely convenient yet effective system to request, collect, and analyze the feedback that plays such a vital role in designing and maintaining an effective onboarding approach. Just as importantly, Hyphen's platform utilizes mobile technology as well as many of the more popular communication platforms already being used within organizations, making your feedback system seamless and convenient to use. Such attributes are essential to maximizing participation rates and collecting the sort of insights needed to optimize the effectiveness of your onboarding. As previously discussed, successful onboarding will continue to pay dividends for each employee as well as your entire organization well into the future. Authentic feedback plays a pivotal role in developing that ever important onboarding process, making it an irreplaceable component of the entire employee experience. The online retailer centers its entire onboarding approach around its culture which, in turn, revolves customer service. The company divides its four-week onboarding into distinct components – the first two weeks of which immerse the new employee into its core values, customer-oriented culture, and the systems that support such efforts. Team building and empowerment is emphasized throughout the month-long process, concluding with a graduation ceremony to mark the importance of onboarding to the organization and its workforce. Afterwards, Zappos continues the relentless pursuit of customer satisfaction throughout every stage of the employee experience. This focused attention to its audience obviously works well for the organization, with 75% of sales stemming from repeat customers despite higher price points relative to the competition. As evidence to the benefits of a highly organized onboarding strategy, Twitter has labeled its onboarding procedures as “Yes-to-Desk,” a month-long process that features coordinated efforts between HR, IT, and other key departments over the course of 75 separate components. New hires are given a bottle of wine, branded t-shirt, workstation assignment, and corporate email address before onboarding even begins. Likewise, Twitter provides a comprehensive onboarding guide in the days before onboarding begins, giving new hires the opportunity to familiarize themselves with the process and complete paperwork ahead of time. To reinforce a sense of belonging and importance, new hires attend happy hours, team lunches, and weekly strategy sessions with senior management. Buffer, a social media management platform, gives us an enlightening example of the need for onboarding that matches the dynamic nature of the marketplace and society itself. Previously well know for it six-week boot camp strategy to envelop new hires in its culture and processes, Buffer has recently reinvented its onboarding strategy, now adopting an approach that places an emphasis on employee well-being, comfort, and Buffer’s core values. Rather than directly emphasizing culture, Buffer instead creates an onboarding experience that focuses on the values that feed its culture. Such a change allows Buffer to foster a more personalized, open atmosphere in its onboarding, now concentrating on improved communication and authenticity throughout the process. Hyphen allows employers to conveniently automate the feedback process, including surveys distributed and collected during typically busy onboarding procedures. In fact, with the surveys, pulse polls, and variety of insightful tools made available through Hyphen’s comprehensive employee feedback solutions, HR and management will be provided the immediate, authentic, and in-depth people data needed to improve and guide every stage of the employee experience. That curated journey begins with onboarding and extends even past employment. Hyphen’s tools not only provide immediate impact, but the building blocks to a successful, productive future as well.